I want Drush 9 on a Drupal 8 production server without having to install Composer. Is there any way to do this? And if that is not possible, can anyone suggest an alternative to Drush especially for maintenance, updating and syncing the site with dev and staging? 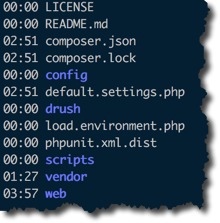 If you don't want composer in production on your server, you can run the composer commands locally to install Drush, then make sure to push the vendordirectory to the server. Make sure to also commit the composer.json and composer.lock files, so that anyone else working with the codebase can handle composer on their own local machines as well. In this way you never need composer on the remote production server, but can get drush. On the production stage we don't need Composer (neither composer.json nor composer.lock), Composer is used to build your project and to generate the vendors after that it is necessary to pack all the generated files and to deploy them on the target server. My D8 instance on the Production servers contains the following at the root. Refer to the Drush Documentation for more info. How to resolve the Composer related error shown using the Drush DL command?